Randy Wales became a truck driver in 1979, drove for a few years and then paused to raise a family. Once the kids were grown, he set out to rediscover his favorite past time: Truck Driving. 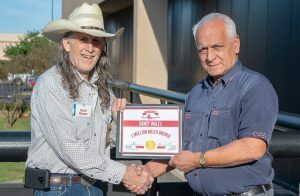 In 2010, Randy attended the Stevens Driving Academy in Dallas, TX, obtained his new CDL and re-qualified his driving skills. That same year, Elizabeth Cooper was recovering from the recession and was looking to become a truck driver. She held the same fabrication job for nearly three decades, but was ready to start a new life doing something different. 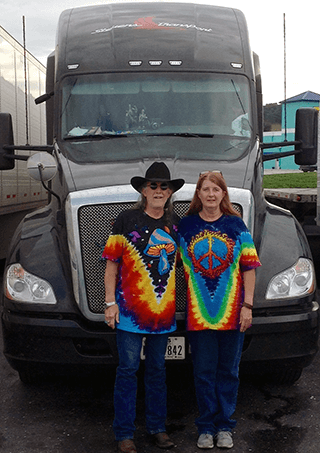 After searching the internet for the best truck driving companies, Elizabeth found her future and started at Stevens Transport in October of 2011. 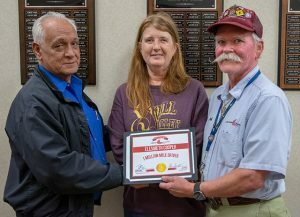 Randy and Elizabeth happened to meet at Stevens Transport during Randy’s safety check-in and Elizabeth’s graduation to solo driver, and they became inseparable immediately. During Elizabeth’s 3-month adventure into graduation driving, she called Randy for everything. He was her coach and they fell in love. They kept in touch and eventually met up “on the yard” at Stevens to discuss becoming a driving team. Team drivers for the Contractor Division were fairly new at that time, so Randy and Elizabeth jumped all over the opportunity to set a precedent. 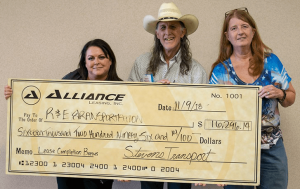 With Stevens Transport by their side, they took the road by the horns and made a very successful living driving together. After completing their most recent lease and seven years of driving as a team, Randy and Elizabeth are embarking on their newest adventure yet. Randy has hung up the keys and is now teaching the new generations of future drivers as a Resident Instructor for Stevens Transport.